St Anno’s Church, Llananno, Powys, Wales. OS grid reference SO 0956 7434. Roughly half-way between Llanbadarn Fynydd and Llanbister on the busy A483 Newtown to Llandridod Wells road, in the Ithon Valley and formerly in Radnorshire, but now Powys, is the hamlet of Llananno with its little parish church of St Anno, which is situated above the eastern bank of the river Ithon. The church is a rebuilt 19th century building on the site of a medieval church and, possibly an even earlier Celtic monastic foundation. But the beauty is inside the charming little church. This is a late medieval carved wooden rood screen and loft, which is said to be the best example of its kind in the whole of Wales. Nothing much is known about St Anno, Annu, Wanno or Wonno to whom the church is dedicated, but there are one or two theories about him/her. It could also be a dedication to St Anne, mother of the Virgin Mary? The town of Rhayader is 10 miles to the south-west and Newtown is 14 miles to the north of Llananno. 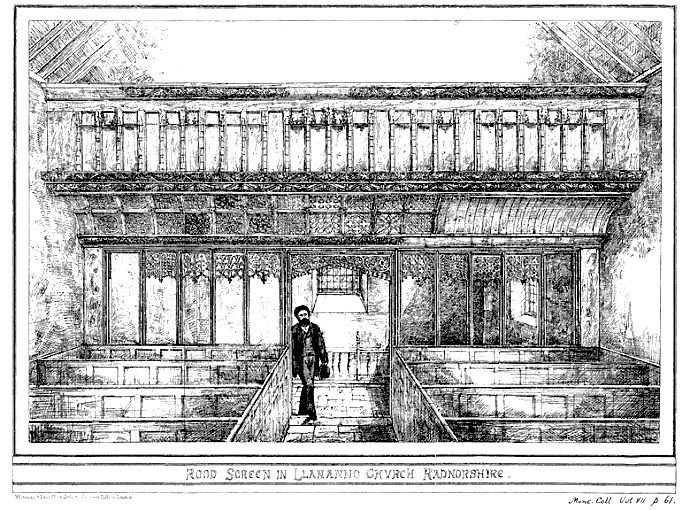 Llananno Rood Screen (Engraving by Whitman & Bass Collections) 1874. In 1876-77 the church was rebuilt and the interior restored to what we see today – stonework from the older church being incorporated into the newer Victorian-style building. The famous carved rood screen and loft was taken out and completely restored by craftsmen. In 1880 it was returned to the church and put back exactley as before, but more beautiful than ever with all the intricate wood carvings looking as though they had just been carved. Historians originally thought the screen had come from Abbey Cwmhir at its dissolution in 1536 but, in fact, it was made in about 1500 by the Newtown school of woodcarvers, and so it is Late Gothic in style and had survived the Reformation. The screen is richly carved with vines and fruits, including pomegranates, oak leaves and acorns, trees, plant stem foliage and berries; the fine tracery work is also beautifully and delicately carved. There are also two scaly, serpent-like animals – having a Greek mythological look about them. The rood loft, above, (sometimes called a gallery) has a long line of canopied niches containing carved figures. Christ is in the middle, while at either side there are apostles, saints and angels. More recently further work was carried out on the rood screen, a process which was finally completed in 1960. Also of interest in the church is the medieval holy water stoup beside the door for the use of parishioners to dip their fingers in when entering the church, the medieval piscina (for the washing of sacred vessels) on the wall near the altar, and the carved pews with bench ends are from the 17th century; the font is of the 15th century. The churchyard is rectilinear in shape but appears to be built over and on an earlier curved enclosure, which still shows at the north and south sides, suggesting that the site is an ancient one dating back to before the Norman Conquest. All in all a very nice place to visit, if only to walk around the churchyard or sit in the church itself where peace and quiet can be found and, to be astounded by the lovely carved, late medieval rood screen. What a delight! The dedication of the church to Anno (Annu), an 8th century saint with a feast-day in some calendars on 20th May, is somewhat uncertain, but he could be one and the same as St Wanno or Wonno, whom has a second dedication at Newborough, Anglesey, and to be identical with St Wonno or Gwynno of Wonastow, near Monmouth, who died in 629 AD and is recorded as being a Celtic missionary in Cornwall under the name of St Winwaloe at the village of Gunwalloe and, to have eventually become an abbot in Brittany, but this is by no means a certainty because “his” feast-day falls on 3rd of March. We may never really know. Zaluckyj, Sarah & John., The Celtic Christian Sites of the central and southern Marches, Logaston Press, Herefordshire, 2006. Gregory, Donald., Country Churchyards In Wales, Gwasg Garreg Gwalch, Llanrwst, Gwynedd, Wales, 1991. Spencer, Ray., A Guide to the Saints Of Wales and the West Country, Llanerch Enterprises, Felinfach, Lampeter, Dyfed, 1991. Whitman & Bass., (Collections), Historical & Archaeological Relating to Montgomeryshire and its borders, Vol VII, p 61, Powys Land Club. 1874. 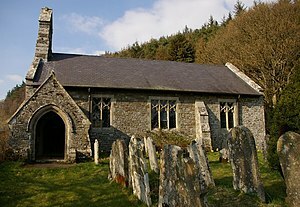 Categories: Ancient Churches / Chapels, St Anno's Church at Llananno in Powys | Tags: St Anno's Church at Llananno in Powys Wales | Permalink.